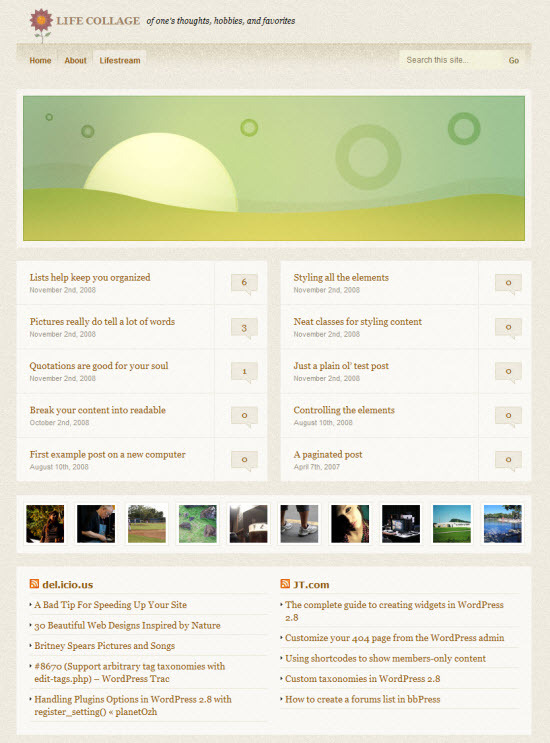 Life Collage is a new Lifesteaming theme for WordPress that is actually a child theme built on the Hybrid framework. What is a WordPress theme framework you ask? Well these are Themes built with flexibility in mind, designed so that you can tweak them to fit your needs. This can usually be done in a way that doesn’t modify the core theme, so that upgrading later doesn’t become a problem. They also often offer a theme settings page that allow for many options to be set in an easy way without having to dig into the code. If you want to learn more or try a theme framework, I came across this great post titled 20 WordPress Theme Frameworks and Starting Resources. So I started by first downloading the required Hybrid theme framework and installed it. I recommend that you activate this theme and then go through the settings page to configure it the way you want. Then you can move on to downloading and installing the Life Collage theme. Once installed you can create your Lifestream by adding a new page and then selecting the included Lifestream template from the dropdown as opposed to the default template. The template will provide a center column that displays short versions of your blog posts. Under that it will then display a ribbon of images courtesy of the FlickrRSS plugin. The Hybrid framework provides many custom widgets and the Life Collage theme adds a custom Lifestream widget that allows you to add as many external RSS feeds to be displayed in a two column format under the ribbon of images imported from Flickr. So that’s about all this theme has to offer at this point but it is version 0.1 so perhaps we will see more features added to take advantage of the framework already in place.